Salli idee sai alguse maikuu lõpupäevil kui meenus hea inimene, kelle lemmiklilledeks olid piibelehed ja kellel jagus armastust väga paljudele inimestele. 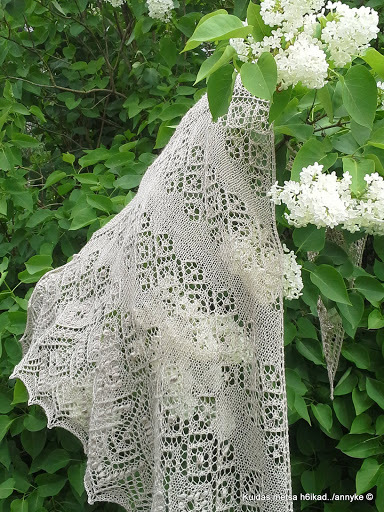 / The idea of shawl was born in the end of May if I remembered one really good person. Her favorite flowers were lilies of the valley and she had so much love to share for so many people. Nii ma siis otsustasin, et salli kuuluvad piibelehed ja südamed. Mustrid on pärit erinevatest pitsiraamatutest, äärepits netist. 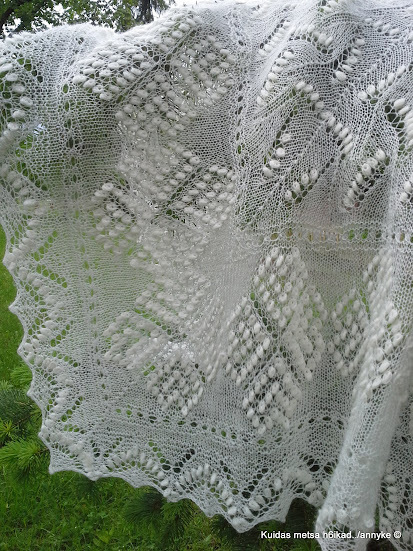 / So I decided that in this shawl pattern should be lilies of valley and the hearts. 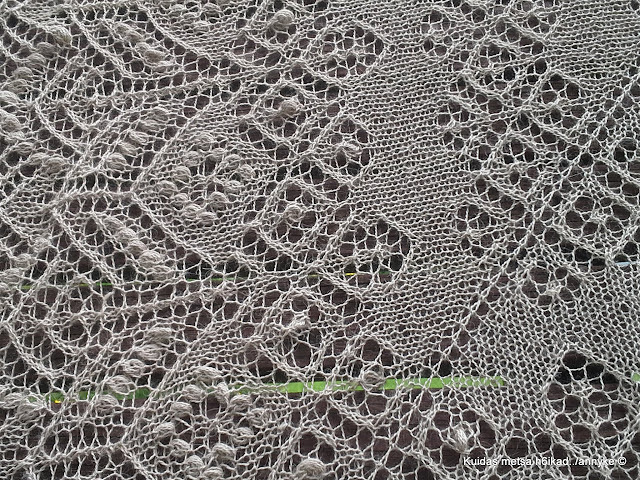 Patterns are taken from different lace – books, edgelace is from internet. 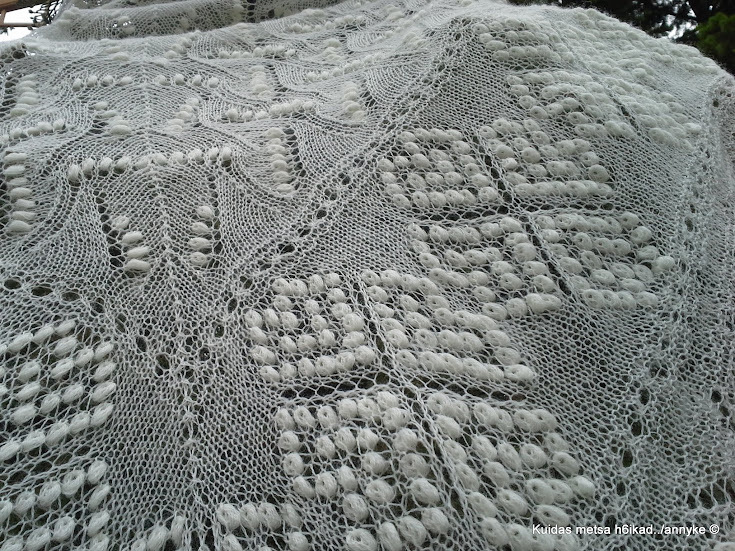 Shawl was knitted with 2.25 mm needles, cast on was done on 4.5 mm needles. Yarn is natural white, 100 % wool; 100 g / 1400 m. Yarn consumption was 99 grams. Dimensions 95 x 200 cm. Sallis on väikesed asjad, mis ma teeks ilmselt järgmisel korral natuke teisiti, aga üldiselt olen üsna rahul. 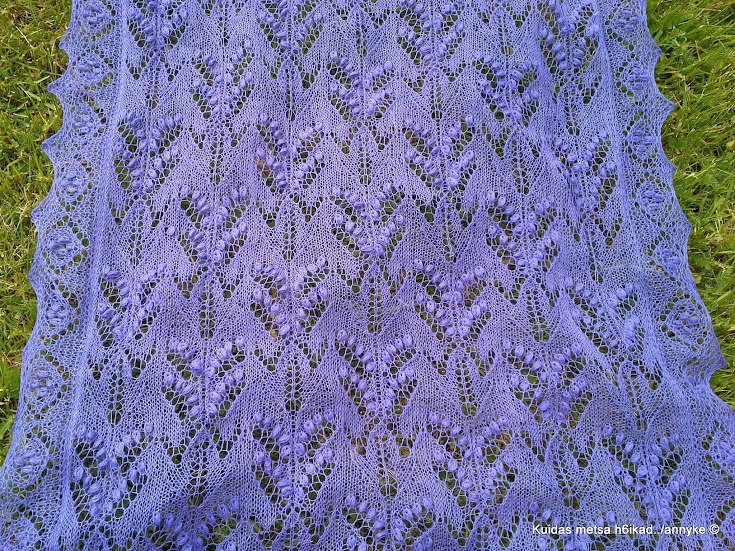 / There are some little things in this shawl, that I should do differently on next time, but mostly I’m pretty pleased. Nautige Suve! /Enjoy the Summer! 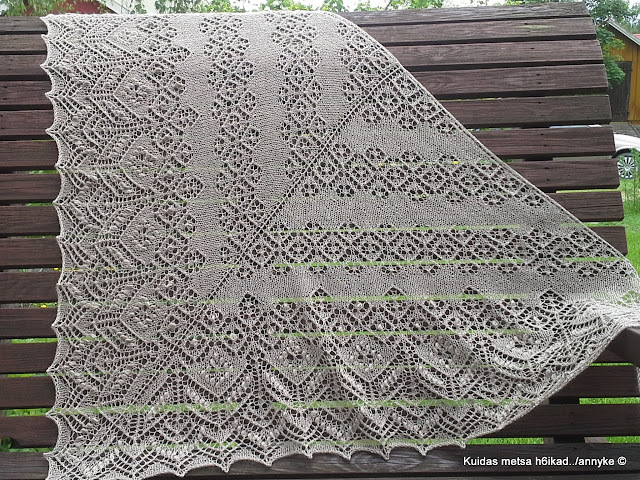 Mustrimaailma salajane rätik/ Shawl from secret KAL in Mustrimaailm. Muster on avaldatud SIIN. Loodetavasti link toimib. /Pattern is available HERE. I hope the link works. Minu salajase kudumise lõpp-tulemus. / My “secret-knitting” shawl is here. Varras 2.25 mm ja lõpetamiseks kasutasin 2.75 mm. /Needles used for knitting 2.25 mm and for casting off 2.75 mm. 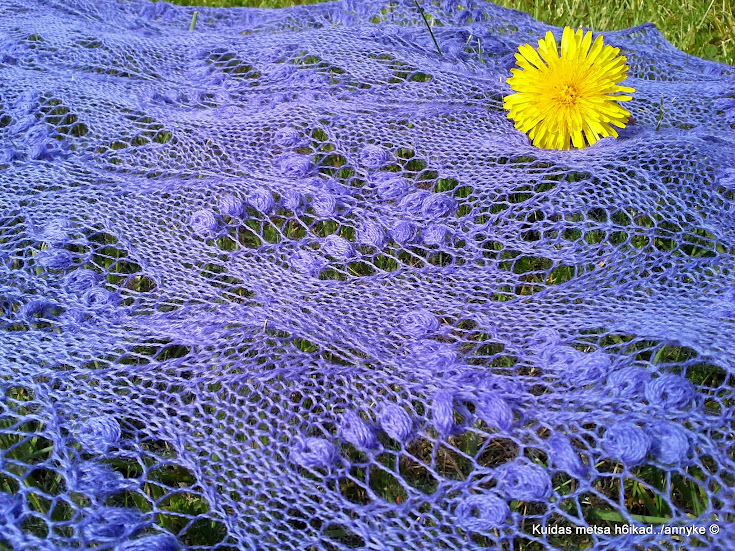 Salli mõõdud 89 x 184 cm ja lõnga kulus 90 grammi /Dimensions are 89 x 184 cm and yarn consumption was 90 grams. Muster on ilus ja kudumine sujub kergelt. Aitäh, Tiina! / Pattern is really nice and easy to knit. Thank You, Tiina! Lõnga suhtes olen ikka veel väga negatiivsel seisukohal. Liiga pehme minu kudukäekirjale ja nuppudest ma parem ei räägigi. /But I still don’t think much about this yarn. It is too soft for my knitting and I will not even begin about the nupps. 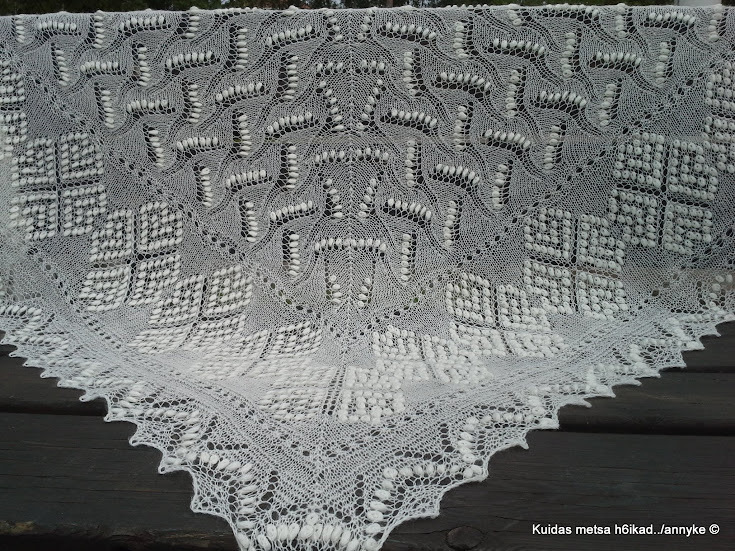 Õnneks on sellega mu Drops Lace’i varud otsas. / So I’m glad that this was my last of this yarn. p.s. Mu inglise keel ei kannata ka ilmselt enam mingit kriitikat / My english is probably really bad already… so I apologize for that. Lõpuks olen midagi ka valmis saanud. / At last I have got something done. Topelt piibeleht, Haapsalu salli raamatust. 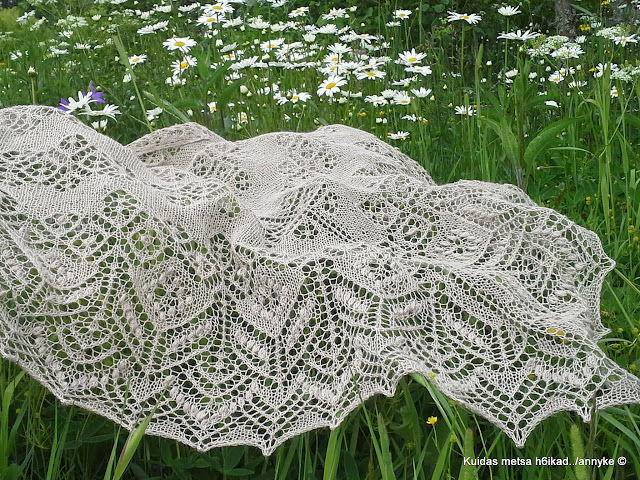 / The Double Lily of the Valley from the book of Haapsalu shawl. 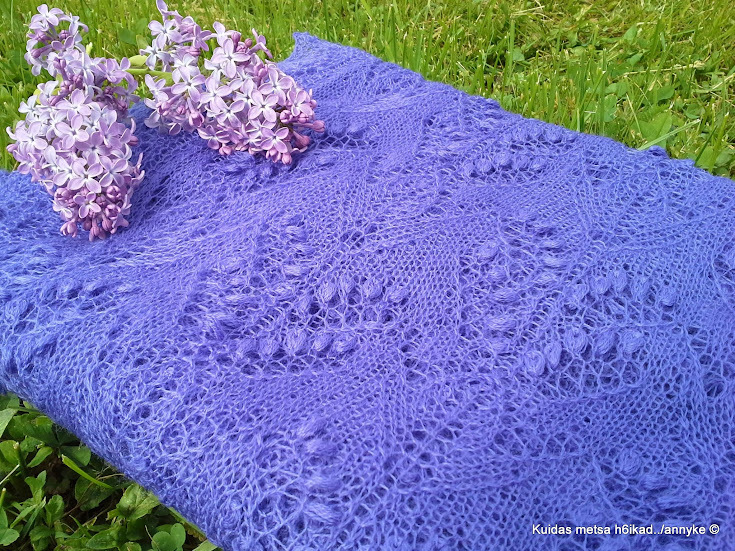 As on last week I had problems with my hand, this shawl has taken little bit more time to make. Yesterday I got it knitted and the sewing part was left for this morning. The weather will be rainy tomorrow, so for taking pictures it’s not suitable. So here it comes, short story and some pictures. 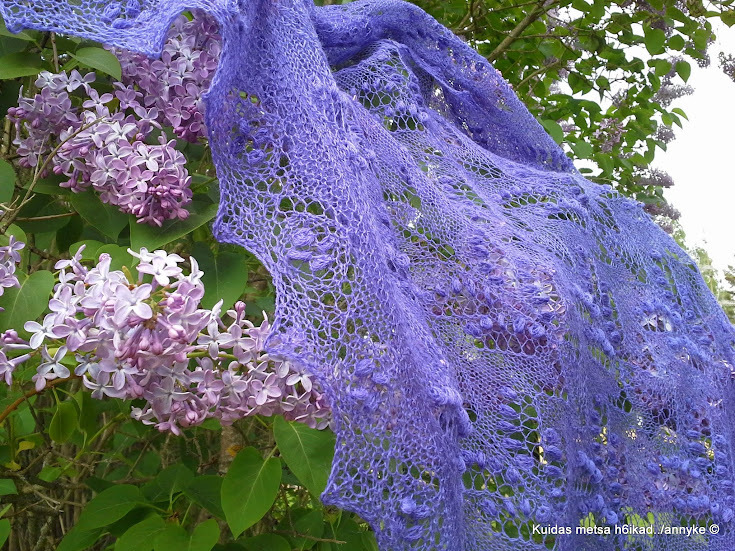 The shawl is again blue on photos, but it should be little more violet. Needles used on centre piece 2.0 mm and on the edgelace 2.25 mm. For casting on I used needles 3.5 mm and 4.5 mm. Yarn is 1400 meters / 100 grams; 100 % wool. Measurements of shawl are 70 x 180 cm. 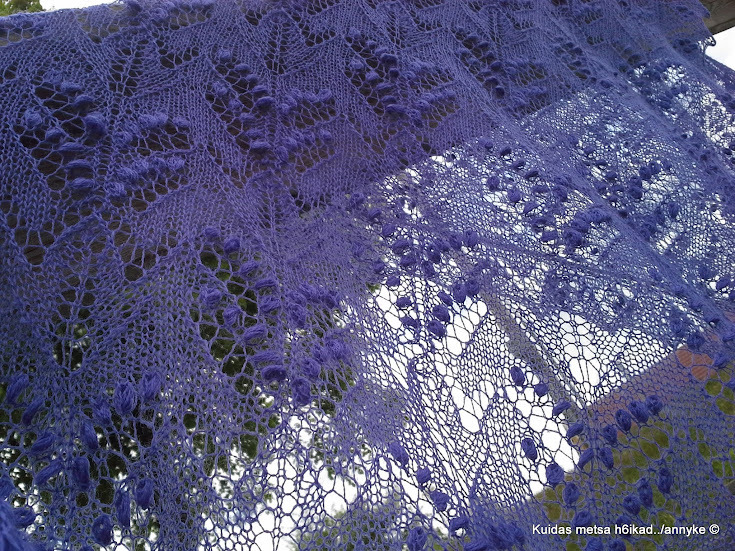 Weight 113 grams, yarn consumption ca 1582 m.
This blogpost is ending now. Enjoy the Summer and be Cool!